Utahredrock: Who the hell are we kidding? In California, for now, there is a consensus that global warming is a serious problem that requires serious action. Under Governor Schwarzenegger’s Administration this consensus has had bi-partisan support. 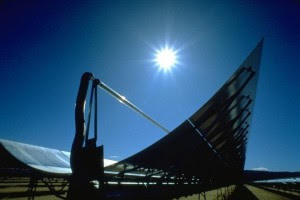 Clean energy technologies like solar require the support of government policies because of the long-term nature of the investment required by the private sector. For anyone not ready to accept that global warming is caused by human activity, or that it is even bad–there are other compelling reasons for supporting most of the key aspects of the climate/energy bill that was just abandoned by Congress. At the top of the list is our dependence on oil and all that that entails. Since the early 1970s an increasing majority of oil consumed in the U.S. has been imported. This means we are shipping our wealth to other nations. That’s bad enough, but we’re also depending on them for the lifeblood of our economy–a dangerous and precarious place for us to be from a national security perspective. Alternative energies are gaining increased adoption in the U.S., but we have a long, long way to go. Last August we encouraged our readers to read “The Elusive Green Economy,” from The Atlantic Monthly–if you haven’t read it yet, it’s an important and educational piece (and not a short one!). This article does an outstanding job of demonstrating the price we continue to pay as a nation by not supporting policies that make alternative energies feasible in the marketplace. During the 1980s, the collapse in oil prices made such policies a low priority in Washington. The Atlantic Monthly article does an excellent job of explaining the long term cost of those policy choices. The downside of lower oil prices is both high carbon emissions and the massive transfer of American wealth overseas. Journalist and author Thomas Friedman has made the promotion of environmental awareness and clean energy two of his signature causes. “We’re Gonna Be Sorry,” is Friedman’s reply to the news that the U.S. Senate will not pursue a climate/energy bill. The U.S. House of Representatives passed a bill last year so Senate action was the only thing separating the legislation from becoming the law of the land (the president is eager to sign it into law). It is ironic that communist China may embrace a market driven solution to that nation’s energy problems before the U.S. Like the U.S., China imports most of its oil. We will be sorry if we don’t STAND FOR LESS and stand for more sensible policies from our leaders. California, as is often the case, is ahead of the curve in this effort. An initiative will be on this fall’s ballot to delay implementation of the California Global Warming Solutions Act of 2006. This would be much less likely to occur and the arguments in favor of delay would have less relevance if the U.S. would adopt a sensible national policy regarding climate change and energy. This post originally appeared at STAND FOR LESS--a campaign in San Diego dedicated toward less consumption and smarter consumption.